I was at a petrol station in rural New Zealand at the weekend which only accepted payment via the automated card reader on the forecourt. After I had filled up, a young woman approached me and asked if I would use my card to pay for her petrol, and she would pay me back in cash. While I tried to work out if this was safe, she said it was OK if I didn't want to, and walked away. Was this an attempted scam, or have I just refused help to someone who needed it? Plenty of people don't have credit/debit cards, if they had cash in hand they were probably just one of those people. Cash first, fuel 2nd with you pumping, not much risk to you in that scenario. Could it have been a ruse to get some free fuel from you or rob you while your guard was down? Sure, but seems less likely. She might try to give you cash for an incomplete fuel-service, which she will continue after you take your card back, leaving you with more cost than she has paid for. Maybe this kind of trick is possible when she doesnt put the nozzle back into the station. If it were me, I probably would have tried to help, being very careful not to fall for one of the above schemes, but I certainly don't blame you for being skeptical. But here in New Zealand we do have a number of automated petrol stations that sell 91, 95, diesel, and perhaps a carwash. They cannot sell LPG without a qualified attendant on site, but they occasionally might have vending machines. These are also known as "truck stops"
These automated bowsers have a card reader and will pre-debit up to $150 NZD off your balance before the pump handle is raised. That's how the service station makes sure you have the wherewithall to cover the unknown total cost. If you have a credit card, that pre-charge is simply "unavailable" but you're not paying interest on it. However if you have a debit card or an eftpos card that "reservation" can cause financial hardship. If it was me I'd totally make a spot judgement call about the person and decide whether to help or not. If it were a spanky new car and the person had smokes then I might decide no, but a frazzled mum driving a beat-up old 90s car is unlikely to be scamming you out of some dollars. I might even hit the bowser with "dispense $20 worth" on my card rather than "fill" and then just leave without taking cash, because its nice to do something for someone. Source - I'm a kiwi. Here's an automated fuel station. Has around 6 bowsers and sells liquid fuel only. There is nobody in attendance. And here's the payment device at a different site. 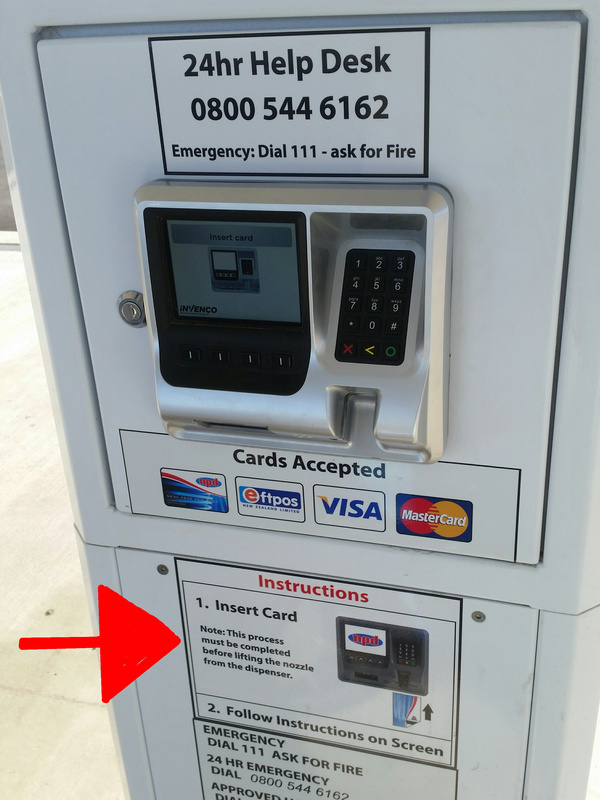 Notice that the fuel pump will not start unless the card has authorised, so if you don't have a card, or your balance is below a preset minimum, then the pump will not start. So OP would HAVE to enter his own PIN - can't just hand over a card and share the PIN. The reader will use the card's chip, and it may read the magstripe for confirmation but some simply ignore it. Then you MUST input your PIN. Once that validates the unit will pre-authorise $150 and signal the pump that it is allowed to start when the trigger is pressed. So no card, no fuel. Insufficient funds and you can't even get $5 of petrol out of these things. If its a scam, its a lot of work for a little bit of fuel. Since the cash option wasn't available at that time, I think Occam's Razor probably applies. Sure a scam is possible, but IMHO that would more likely have involved someone with no money and no wallet begging you to not leave them stranded at the gas station. If she never touches your card it is really just you selling her a gallon of fuel, not that big a deal. If she wants to buy a full tank then check the security features on the currency. If there is an alternate petrol station nearby suggest they try there for cash transaction or just donate her the fuel to get there if her car is on fumes. I would ask them to pay it forward rather than accept a small amount. If you feel victimised ask to check her fuel gauge first to verify the need. Some people don't have or carry credit cards, for various reasons... so this could be legit. But there are ways of using this situation to take advantage of someone. One way it could be a scam is that she does this all day hoping someone hands her their card for her to go swipe at the machine, during which time she can photograph it and use it for online purchases later or sell the card's info. Another way this could be a scam is if she is trying to use this as a distraction, either to mug you or to pickpocket you, possibly with the help of someone else. (Less likely due to all the security cameras at gas stations, but criminals aren't always the brightest minds). One way to protect yourself is to take her $20 cash, pre-approve to pump up to $20 on your card, swipe the card yourself and walk away. It's quick and you don't have to stand there and pump it yourself. To offer a different perspective here. We had an issue here in the states where someone would do something similar. They get you to run your card, or they prevent the pump from properly hanging up and completing a transaction after someone has finished. Then, once they have access to an active pump, they come through with like 5 cars and fill them all up, and also some gas cans. I'm hopefully not too opinion-based here. If someone hands you $XYZ to fill up the same exact amount in their vehicle, with you there during the entire transaction, I cannot understand how that could be fraud*. Either they don't have a card on them, they don't have the funds available in their card, or there are strange requirements that they can't enter (in the US some older card stations require a zip code which, if international, you can't enter one). Simply accept the cash, fill their tank if you have the funds in your card, like the kind person you are, and you're finished. I would be wary of giving someone my credit card in hands in this ocasion, since she might write down (or take a picture of, or memorize(!)) my card number and CVV and later make a fraudulent online purchase which might go unnoticed by some. But one can take simple precautions around this. The cash could have been counterfeit. It very well could have been a scam. Not the answer you're looking for? Browse other questions tagged scams new-zealand or ask your own question. A friend wants to use my account for a wire transfer. Is this a scam or is it legitimate? Someone wants to use my credit card to put money in? Is it scam? Someone wants to send me cash by DHL. How's this scam supposed to work? A woman on FB offering to pay my debts. Scam? Someone wants to pay off my credit card bills. Am I being scammed?